So, how has your new year started off?? Are you getting stuff accomplished?? Did you make resolutions or goals?? Are you sticking with them?? Me, I am getting a slow start. With three little ones, it makes it difficult to get the things accomplished that I want to, but I know that with time, I can work on it and meet my goals. I did sneak some time in last night, after the kids went to bed, to make a card for a couple of challenges. I used the sketch from CPS (148) and the basic white card with an Asian theme challenge at Cuttlebug Challenges (Be Inspired #65) to make my card. The stamp is an older Stampin' Up! image that I colored with my watercolor crayons. Carstock, ribbon, stamps, ink, corner rounder, watercolor crayons: Stampin' Up! Beautiful! That is a gorgeous image. Beautiful Amy! Gorgeous image and I love all that white space! you really hit this card on the money--definitely a tranquil card :D lovely image too! Very pretty! I love the rounded corners and sentiment! Thanks for joining us at CPS this week! `WoW` I love your beautiful card Amy!!!!!!.. 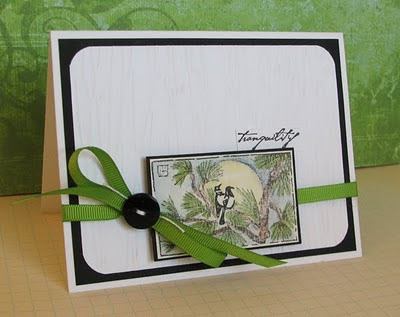 I just LOVE this absolutly tranquil and beautiful card!! !